Whether you are wearing a brooch in the traditional fashion or wearing a Celtic pin with your everyday clothing as a unique accent, our Celtic style brooches and pins are the perfect way to show your heritage or interest in the ancient culture. Our Celtic brooches are made from the finest pewter or sterling silver, and they feature popular Celtic symbols like the thistle, Claddagh and lots of Celtic knotwork. Use our brooches to keep your cloak or cape closed or as an everyday accessory. We have traditional penannular brooches to more modern designs with pin/clasp backs. 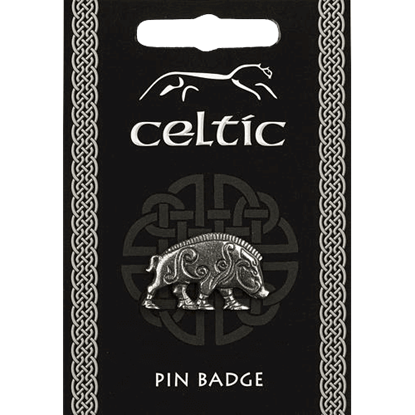 The Celtic Boar Pin Badge depicts an animal revered for its ferocity and aggressiveness. A defiant beast that is not easily defeated. It embodies the key characteristics of a warrior such as courage, stubbornness, and strength. Linked with the eternal power represented by the Celtic Knotwork in this design, loyalty is lifted to new heights. 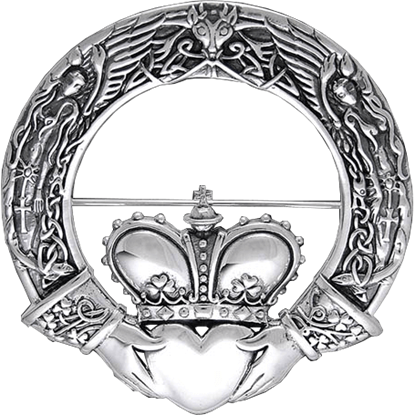 This sterling silver brooch pays tribute to Celtic art with the Claddagh design meticulously etched into the side. A floral emblem of Scotland, the thistle stands for nobility of character and birth. 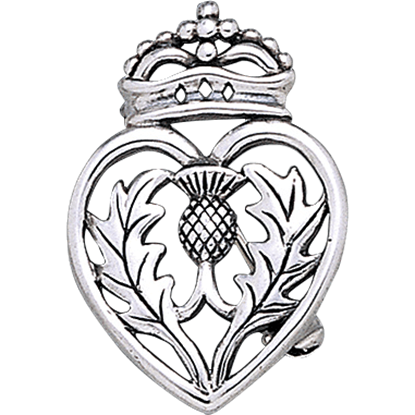 The Crowned Scottish Thistle Brooch displays this prickly flower within a heart frame with an ornate crown perched on top. 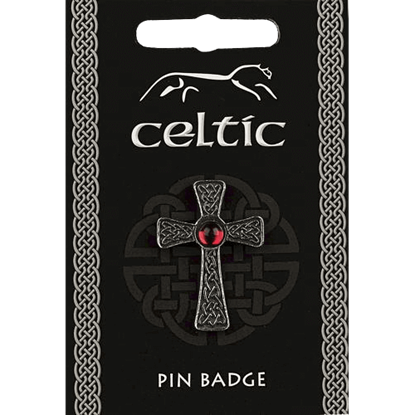 The Gem Cross Pin Badge represents the beautiful artwork and faith of the Iron Age Celts. This commemorative jewelry piece is a great accessory for the daily celebration of history, or the perfect gift for a fellow history buff. 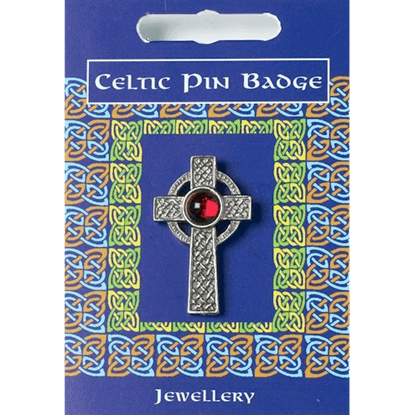 This Interlaced Cross Gem Pin Badge is made from lead-free and is supplied with either a blue, red or green gem. The information card is full color on the front and has historical information on the reverse. 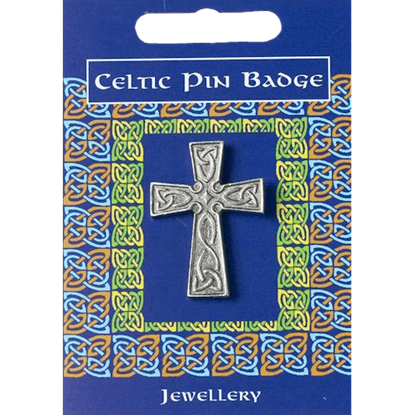 This Interlaced Cross Pin Badge is made from lead-free pewter and displays Celtic design. The information card is full color on the front and has historical information on the reverse, making it great for wear and learning. 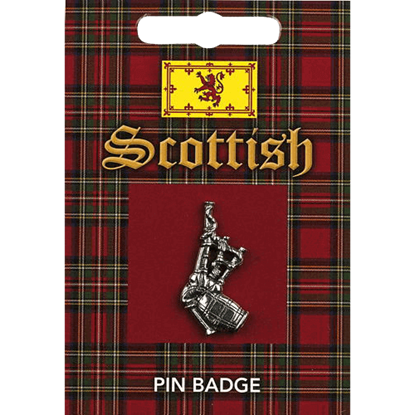 The Scottish Bagpipes Pin Badge depicts a wind instrument easily recognized around the world. 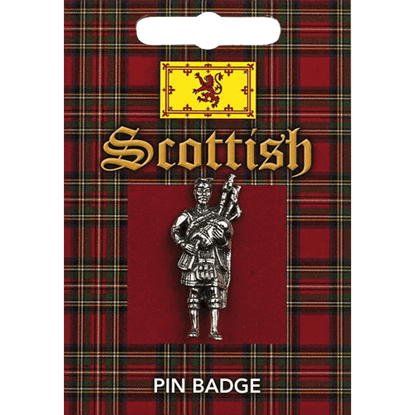 It inspires visions of a musician in Highland dress, playing a melodious tune in celebration or leading his fellow clansmen into battle. 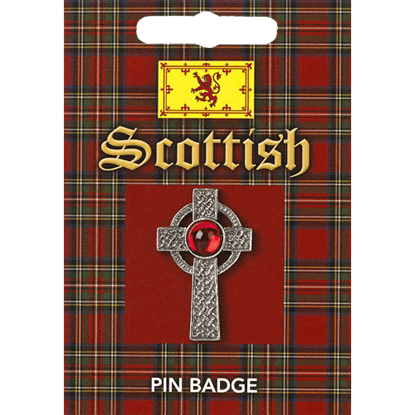 The Scottish Celtic Gem Cross Pin Badge takes inspiration from the numerous ringed crosses seen in the ancient architecture and artwork of Scotland. Its predecessors serve as a prime example of Insular art from the early Middle Ages. For hundreds of years, these soldiers took to the frontlines, leading the way into the battle, rallying troops, and intimidating enemies with their brave song. 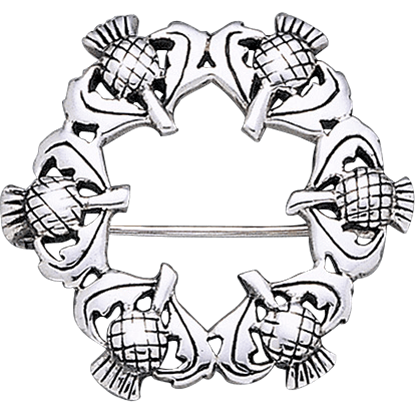 The Scottish Piper Pin Badge honors the bravery and skill of said warriors. According to a 13th century legend, this prickly flower cut short an ambush attempt by Norse invaders. Since then, it has become the proud emblem of Scotland. 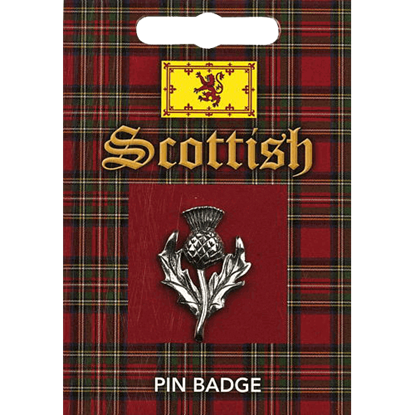 Celebrate its rich history and culture with the Scottish Thistle Pin Badge. The national floral emblem of Scotland, the thistle, as seen in the Scottish Thistle Wreath Pin, displays a prickly blossom and leaves which supposedly alerted the Scots to a stealth invasion when one was stepped on. 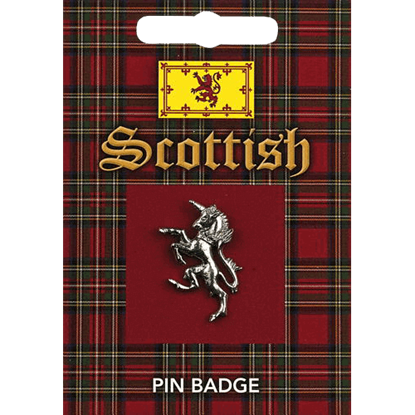 The Scottish Unicorn Pin Badge depicts a beast said to be both powerful and chivalrous among many admirable traits. As the natural enemy of the lion, which served as Englands herald, it was the perfect symbol for 15th century Scotland.